WASHINGTON - Workers in Iran's southwestern province of Khuzestan have launched an extended protest against water shortages and nonpayment of wages. 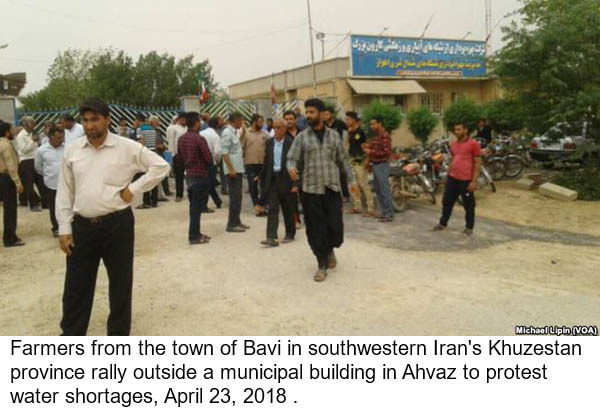 Social media users who contacted VOA Persian said farmers from the town of Bavi protested for a third straight day outside a local government building in nearby Ahvaz city on Monday. They said the farmers complained of not receiving enough water to irrigate their crops. Meanwhile, social media activists reported a second consecutive day of protests by municipal irrigation workers in the town of Hamidiyeh on Monday. The activists said dozens of workers began the protest on Sunday, rallying outside a municipal building to protest delays in their salary payments. They said a local official in Hamidiyeh, also near Ahvaz, acknowledged that five months' wages had not been paid. But it was not clear when the issue would be resolved.